Get news and updates on MMA (mixed martial arts), which is a full-contact combat sport with different striking and grappling styles, and which allows competitors to fight standing or on the ground. An MMA bout can be stopped by the referee due to a submission or knockout by one of the fighters. Follow RT for the greatest MMA fighters of all time, like Khabib Nurmagomedov, Fedor Emelianenko, Conor McGregor, and Jeff Monson. Don’t miss the news and articles on the latest developments in MMA, including championships. Brazilian MMA fighter Joyce Vieira was forced to use her mixed martial arts training to send an x-rated fan packing after he reportedly approached her in a state of undress as she posed for a steamy beach photoshoot. 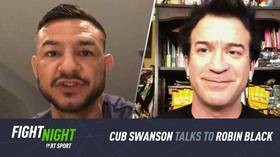 UFC veteran and longtime featherweight contender Cub Swanson joined Robin Black on Fight Night on RT Sport and lifted the lid on his early days as an MMA fighter. 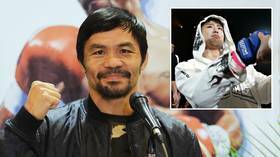 Rizin FF boss Nobuyuki Sakakibara revealed Manny Pacquiao hasn't signed a contract with the Japanese MMA promotion, but he would love to book the Filipino boxing hero in an exhibition bout with Japanese MMA legend Takanori Gomi. 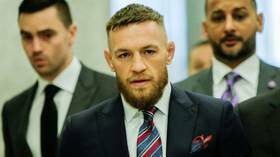 A civil lawsuit against UFC superstar Conor McGregor was dropped after the man whose phone he allegedly smashed and stole dropped the charges against the Irish MMA fighter. 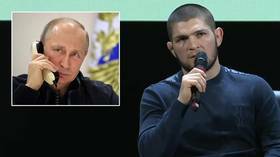 UFC champion Khabib Nurmagomedov has detailed the conversation he had with Russian President Vladimir Putin following his victory over MMA superstar Conor McGregor last October. Iranian MMA featherweight Ali 'Young Emperor' Yousefi registered two highlight-reel finishes at Fight Nights Global 92 in Moscow after the referee in his bout failed to stop the fight after the first big knockdown.